Happy Skin Say Eye Do Easy Eyeshadow is Indeed Very Easy-to-Use! Most of the makeup students I meet complain about eyeshadow application! I don't blame them, it is indeed one of the most challenging makeup step after foundation and brows! I always tell my students during workshop that eyeshadow application really is tricky because you don't have exact set of rules for that! It all boils down to personal preference, eye shape and a whole lot more! In my opinion, the best way to start practicing is by using the least amount of product as possible and practice BLENDING first before anything else! And one product that Happy Skin came up with is actually very friendly to first-time eyeshadow users at the same time, quite fun to use for makeup enthusiasts like myself! "Make a vow to achieve prettier eyes every day with the Happy Skin Say Eye Do Easy Eyeshadow Cushion Duo Pen. This double-ended tool promises to create effortless eye makeup on the go without a brush! The double cushion tips allow instant color pick up from the eyeshadow-filled caps while being gentle to the delicate eyelid area. Featuring micro-fine shimmer hues in Champagne and Espresso, these easy-to-blend colors give the best makeup mileage. Perfect for everyday use, this is all you need to take you from desk to dinner to create different looks. 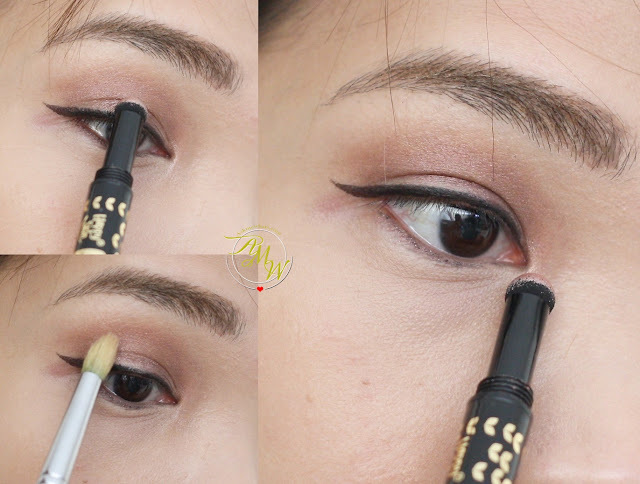 It's time to say yes to easy eye makeup looks!" The packaging is like that of a "pencil" with 2 sides that includes 2 shades that is universally flattering. According to the box description, this eyeshadow cushion duo features Argan Oil that helps color glide on smoothly, effortlessly and evenly. Aside from the smooth application, Argan Oil is said to help nourish the delicate eye area. Thankfully, the Happy Skin Say Eye Do Easy Eyeshadow is not just easy-to-use, I can actually get away using just this eyeshadow duo minus the eye primer! I start by applying Espresso all over the crease as shown on photo below and gently blend out the edges with a clean blending brush! What I do is to do this step layer-by-layer to create the right dimension I'm aiming for. Once happy, I use the Champagne side to brighten up the center of my lid creating that "halo" effect. Champagne is a shimmer baby pink shade that works so well as a highlighter I also like to highlight the inner corner of my eyes. With the same sponge tip, I apply Espresso on the outer corner of the lower lash line and brighten up my waterline with Champagne. 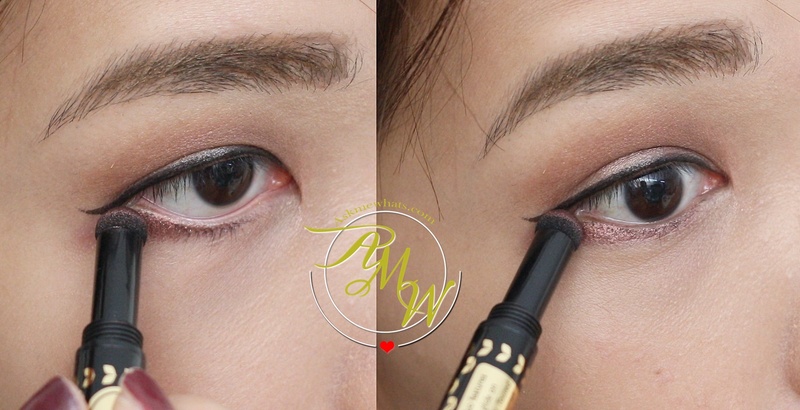 You may skip this step if you're uncomfortable applying powder on the lower eye area but I actually like the effect and it doesn't irritate my eyes. Simple, natural, daytime eyeshadow look using Happy Skin Say Eye Do Easy Eyeshadow! A little amount goes a long way! I can get away applying just a layer or 2 of espresso and the result is really nice and professional. Both shades are highly pigmented and beautiful to use. Suits fair to dark complexion. My only complaint is that I find it difficult to grab the "right amount" of product especially if I'm halfway using this product. Indeed a very easy-to-use eyeshadow that I actually enjoy taking along with me on short out-of-town trips! Also a nice eyeshadow product for touch-ups in between meetings. Overall, I can't wait for the brand to come out with more shades! But the 2 shades included in this pen is definitely 2 of the most sought-after shades that works for most (if not) ALL Filipinas. How do you feel about Cushion-type applicator for eyeshadows? old-school eyeshadow packaging when you travel? For more information, visit http://www.happyskincosmetics.com. The color is very in season because it somehow looks "bridal".